Another 'perfect' evening, warm and muggy, proved just as 'perfect' as the one before. I fished a completely different stretch and tried worm on one rod, fished on a Dyson rig in the hope that a bootlace would take a nibble. The bobbins didn't so much as jiggle. I packed it in early. It's more than possible the eels have taken to feeding later. Or maybe earlier! It had tried to spit with rain as I arrived but it was brief shower. There were plenty of small fish topping in various spots around the small pond. First cast and I got one. A small, just right, roach. From then on it was a bite a chuck. Every one a rudd. They ranged from perch-bait size to zander-bait size with an odd pike-bait. The tiny ones and the big ones got returned. The atmposphere by the pond was one of high summer. Lush plant growth filled with chirruping grasshoppers. Swifts screaming high overhead, and swallows swooping down to take a sip from the pond. It was a good afternoon for dragonfly watching too. There were numerous blue and blue-tailed damsels skimming the surface around my float and the marginal rushes. A brown hawker hawked up and down wind. A lone common darter darted past and an emperor put in an appearance. The highlight was a single male banded demoiselle which flew by. The first I've seen at this pond. The bites slowed after three quarters of an hour. 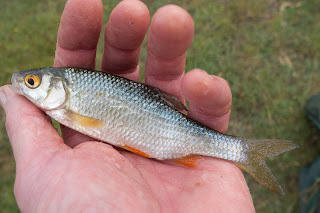 There had been a couple of small perch and another roach amongst the rudd. I made contact again by casting downwind. It seemed that when a light breeze had sprung up the small fish had followed it. I moved closer to them and began to get bites more frequently again. Out of the blue one of the bites found the fish swim out into the pond instead of skimming straight in before being swung to hand. A flash of bronze had me confused. 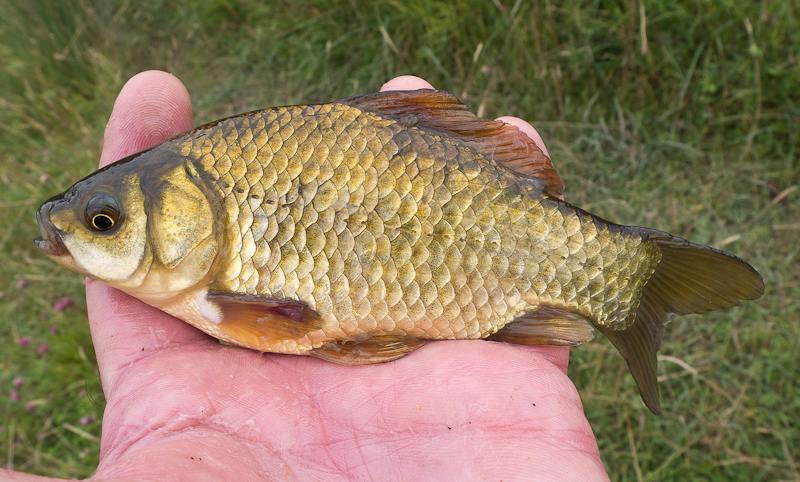 When it got closer I thought it was a crucian, but once in my hand it clearly wasn't. I'm guessing it was a brown goldfish, there are fancy goldfish in the pond - some with elaborate tails. Whatever it was it was a personal best! A few more rudd and perch were caught before I once more found myself connected to a fish that needed playing out. Another brown goldfish, but a bit bigger. Two PBs in less than an hour! It was getting towards home time so I told myself one more fish and I'd go. The float dipped and for a third time I hooked a goldfish. I packed up and went. Ponds like this can throw up surprises aside from dumped pond and aquarium species. I used to fish one that only produced rudd. Fish up to hand size at the most. Seemingly suddenly I'd catch an occasional perch of similar size. It was a small and very weedy pond with just a central clear area and a couple of channels through the bistort. 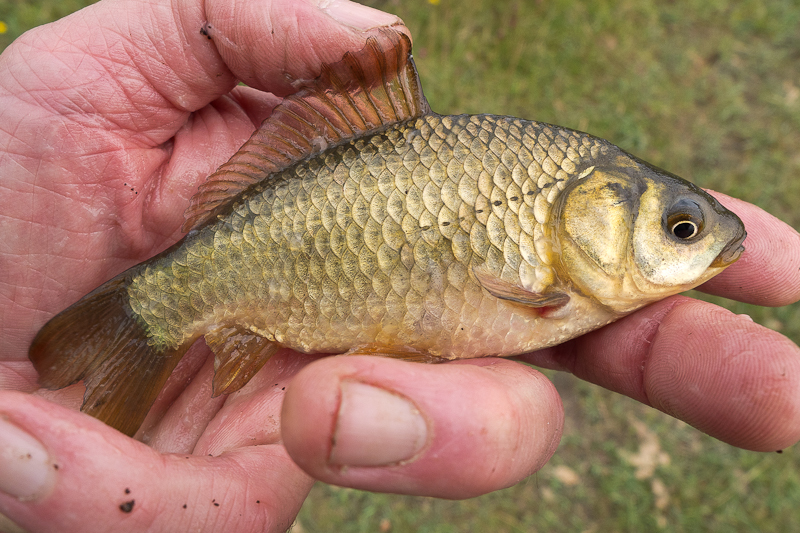 Some of the bigger rudd would make it to the bistort stems when fishing the float tight to the leaves. One day I hooked something much more powerful than anything I'd hooked there before. I have no idea what it was. I'm guessing either a larger than average perch, or maybe an eel. It could have been a 'monster' rudd, or even a goldfish for all I know. But it was completely unexpected.